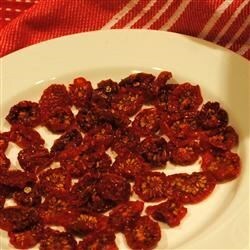 "Cherry tomatoes are easily dried in a food dehydrator. When I make soup or stew I throw in a handful, and they taste like they were just picked. You could also rehydrate them in warm water for some other use." Cut each tomato in half through the middle, not the ends. Put the tomato halves in a food dehydrator, cut side up. Dry for at least 12 hours. When the tomatoes are totally dry and firm, put them in a plastic bag, and store in the freezer. If you have a convection oven - set it really low. Then you don't need a food dehydrater. My new Electrolux oven worked PERFECT for this and i could do a million at one time.